This is a list of the best skincare products that I have come across in my years of using various medium to high-end products. I use a mask or peel morning and night, so have a bit of experience with them. This is absolutely the best mask I have come across. This is the one I turn to if my skin has been flaky or dull. It leaves the skin clear, soft, and glowing. Be sure to follow the instructions and use warm water to open your pores before using. Layer it on relatively thick - until you cannot see your skin underneath any longer - and wait until 5 minutes or so after you think it's dry. It will pull at your skin quite a bit - that's why it's good to open your pores beforehand. The best way to get it off is to remove it with a washcloth, not rinse, and be sure to use warm water. I especially like this as it isn't as expensive as a lot of the other masks - about $25 for 3.4 ounces, so there is a good bang for the buck here. This is my second-favorite mask. It uses exfoliation along with a chemical peel-type action. Compared to the Origins Charcoal mask, it will get off more dead skin. Be sure not to use it if your skin is very dry. For sensitive skin I would not recommend this as it tingles quite a bit until you get used to it. I always leave it on for 20 minutes or so - a bit longer than the instructions say. After the time is up, use a little water to moisten it a bit and rub it in little circles to exfoliate further. Then remove with water and a washcloth. Exfolikate is definitely on the more expensive side. This is the mask I turn to when my skin is a little dry or my nose is a little red. This goes on like whipped honey and feels so good on the face. It tingles a little, but then leaves your face soft and glowing. I leave this on for forever. Once or twice I even slept with it on. After half an hour or so I think the benefits of leaving it on dissipate. You can just rinse this off with water, or wipe with a tissue to remove excess and use it as a nighttime moisturizer. It's pretty expensive, but a little goes a long way with this one. This is a very nice mask. It exfoliates and has a nice tingle. It is very expensive, though, and for the price I think that Exfolikate works a little better. If you have a chance to get it on sale I'd recommend trying it out. This is also used much like the Exolikate, witha period of rubbing it in with water after your times is up. Definitely remove with water and a washcloth. Glamglow is releasing tons of masks now. I've tried a few, and this is the only one that I'd really recommend. This is a gel mask that has inadvertantly become a go-to. Doing masks every day I get a bit weary of the application process and the amount of product that can end up left on my fingers to wash off. Not so with this one. After washing and drying your face, put on a light layer of the gel. Leave it on for 10 minutes, and then wash off. It's not an amazing mask and offers only a little bit of exfoliation, but it also seems to make the lines on the forehead and around the eyes (probably shouldn't use it around the eyes, but hey, I'm a risk-taker) disappear a bit. Easy on, easy off. Murad's Intensive-C line has been pretty good to me. I really adore their SPF eye cream and their face wash. I've found that the Intensive-C products are best used right around sun exposure and this is no different. During the summer I use this about twice a week and it keeps my skin from having a dull appearance. Vitamin C is supposed to be a good antioxident, but I can personally make no claims regarding that. This is easy to put on, a lot like the Ole Henriksen Lemon Strip Flash Peel, and easy to take off. Apply for 10 minutes and then rinse. This is a peel you put on with cloths, so it is super easy compared to anything else. You still have to wash your face first, but sometimes I cheat by wiping an alcohol-based toner across my face and applying this once it has dried. The peel comes with two cloths per pack - step 1 and step 2. You apply step one, wait 2 minutes, then apply step 2. I have found that there is more than enough moisture on each of the pads, and usually end up giving my husband the "leftovers." I get a nice peel out of it, and he gets a decent one as well. It leaves the skin a little sticky-feeling, but the next day things are generally smoothed out and clear looking. It seems to help with my freckles (which I really don't like). Very pricey for a full box, but Sephora often has samples or promotions, so that's what I keep my eye open for. This one is the most fun. Apply it a little thickly after cleaning your face. It's sky blue and goes on with a cooling sensation. You leave it on for 25 minutes or so, until 10 minutes or so after you think it's fully dry. Then you pick a corner and peel it off! I've once managed to get it to come off in one piece. Also it's a fun one to scare your significant other with since you look like an alien while it dries. This leaves the skin soft and, like the packaging says, calm. Good for the winter when the skin can be a bit raw from the cold and wind. This is a 10-minute mask "to rescue problem skin." It is very similar - but cheaper - than Murad's acne mask. It smells pretty similar as well. I've not had much luck with the skin-clearing part of it, but I get hormonal acne, not regular acne. It does leave my face feeling really clean, but no more so than it would by using a facial cleansing brush. It does help with the little zits that pop up around my nose if I've used heavy foundation the day before, so that's a win. Like their Cool Blue Calming Mask, this is supposed to be a peel-off mask. It really does feel great once it's off. Not so much exfoliating as just an all-around fixer-upper. My only issue with it is that it's impossible to peel off! I've tried using a little and a whole lot. It seems like a middle approach to it leaves it so you can peel it off, but only in small strips at a time. It's a little frustrating. If I found a two-pack of the Blue and White masks again I'd still purchase it, but not by itself. So many other masks to try! The best mask for you just depends on your skin and what you're looking to get out of the mask. 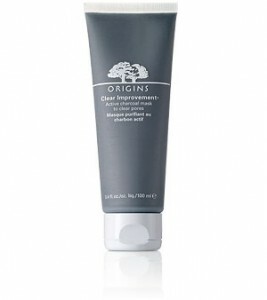 For clearing and softness, go for the Origins Clear Improvement Mask. For exfoliation, you can't do much better than Exfolikate. For calking and softness, Fresh's black tea instant perfecting mask is the one to buy. I hope this list helps sort through some of the many masks on the market!